Mechanical Contractors serving the New Jersey area with Cogenerators for over thirty years. However big or small the co-gen job, we can do it all from start to finish! 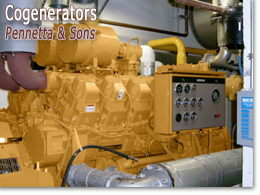 We provide expert installation, service and repair of all co-generation technology. A typical cogeneration system consists of an engine, steam turbine, or combustion turbine that drives an electrical generator. A waste heat exchanger recovers waste heat from the engine and/or exhaust gas to produce hot water or steam. Cogeneration produces a given amount of electric power and process heat with 10% to 30% less fuel than it takes to produce the electricity and process heat separately. Cogeneration systems have been designed and built for many different applications. Large-scale systems can be built on-site at a plant, or off-site. Off-site plants need to be close enough to a steam customer (or municipal steam loop) to cover the cost of a steam pipeline. Industrial or commercial facility owners can operate the plants, or a utility or a non-utility generator (NUG) may own and operate them. Manufacturers use 90% of all cogeneration systems. 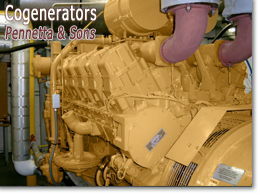 Some industries and waste incinerator operators who own their own equipment realize sizable profits with cogeneration. Another large-scale application of cogeneration is for district heating. Many colleges and cities, which have extensive district heating and cooling systems, have cogeneration facilities. The University of Florida has a 42 Megawatt (MW) gas turbine cogeneration plant, built in partnership with the Florida Power Corporation. Information on the system and other technical references are available on the World Wide Web (see address below). Some large cogeneration facilities were built primarily to produce power. They produce only enough steam to meet the requirements for qualified facilities under PURPA. If no steam host is nearby, one can be built. For example, there are large (80 MW) plants operating under PURPA that have large greenhouses as "steam hosts." The greenhouses operate without losing money only because their steam heat is virtually free of charge. These types of plants are candidates to become EWGs in the new regulatory environment. Many utilities have formed subsidiaries to own and operate cogeneration plants. These subsidiaries are successful due to the operation and maintenance experience that the utilities bring to them. They also usually have a long-term sales contract lined up before the plant is built. One example is a 300 MW plant that is owned and operated by a subsidiary co-owned by a utility and an oil company. The utility feeds the power directly into its grid. The oil company uses the steam to increase production from its nearby oil wells. Cogeneration systems are also available to small-scale users of electricity. Small-scale packaged or "modular" systems are being manufactured for commercial and light industrial applications. Modular cogeneration systems are compact, and can be manufactured economically. These systems, ranging in size from 20 kilowatts (kW) to 650 kW produce electricity and hot water from engine waste heat. It is usually best to size the systems to meet the hot water needs of a building. Thus, the best applications are for buildings such as hospitals or restaurants that have a year-round need for hot water or steam. They can be operated continuously or only during peak load hours to reduce peak demand charges, although continuous operation usually has the quickest payback period.